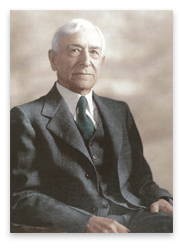 Frank Albert Fetter (March 8, 1863 – 1949) was an American economist of the Austrian school. His major contributions were in the fundamental areas of economics, including theories of value, capitalization, rent, interest, and wages. Fetter was a passionate proponent of the Austrian view of the subjective nature of value. He saw economics as essentially the study of value, and that the motivating force in economics is the feelings of people, their desires and needs, which are not limited to material wants but also include social and spiritual desires. Thus, the ultimate driving force is human satisfaction. He noted that individual differences support the harmonious functioning of society through the natural division of labor, with exchange of goods and services permitting satisfaction of the needs of all. He applied this thinking to international trade, advocating division of labor among nations and regarding commercial exchange as an agent of progress toward a world federation of humankind. Frank Albert Fetter was born on March 8, 1863, in the farming community of Peru in north-central Indiana, to a Quaker family during the height of the American Civil War. Fetter proved an able student as a youth, as demonstrated by his acceptance to Indiana University in 1879 when he was only sixteen years old. Fetter was on track to graduate with the class of 1883, but left college to run his family's bookstore upon news of his father's declining health. This proved to be an opportunity for the young man to acquaint himself with some of the economic ideas that would later prove formative. Chief among the intellectual influences Fetter encountered at this time was Henry George's Progress and Poverty (1879). After eight years, Fetter returned to academia and, eventually, earned his Ph.D. in 1894 from the University of Halle in Heidelberg, where he wrote his doctoral dissertation on the subject of population theory. After earning his doctoral degree, Fetter accepted an instructorship at Cornell, but left to become a professor at Indiana University. After a short stay at Stanford University, Fetter went back to Cornell in 1901, where he remained for ten years. In 1911, he accepted the position of chairman in an interdisciplinary department at Princeton University that incorporated history, politics, and economics. Fetter was the first chairman of Princeton University's department of economics and social institutions. Fetter died in 1949 in Indiana. In the period between the founders of the Austrian school (Menger, Böhm-Bawerk, and Wieser) and its next generation (led by Mises and Hayek), Frank Fetter was its standard bearer. His Principles of Economics (1904) constructed a general theory of economics in the Austrian tradition that went unsurpassed until Ludwig von Mises' treatise of 1940, Nationaloekonomie. Every theory must ultimately meet two tests: one, that of internal consistency, the other that of consistency with reality…[which in his case meant, not to empiricism, but the]…rude contact with the world of events [which] is often what tests or betrays theory, and forces thought out of the conventional ruts (Fetter 1904). Fetter's major contributions to distribution theory encompasses all the categories of capital, rent, and interest, in an unusually systematic and integrated theory of distribution, all areas of analysis being interrelated. His imaginative contribution was to seize upon the businessman's commonsense definition of rent as the price per unit service of any factor, that is, as the price of renting out that factor per unit time. But if rent is simply the payment for renting out, every unit of a factor of production earns a rent, and there can be no "no-rent" margin. Whatever any piece of land earns per year or per month is rent; whatever capital goods earn per unit time is also rent. Rent then becomes synonymous with the unit price of any factor; accordingly, a factor's rent is, or rather tends to be, its marginal productivity. For Fetter, the marginal productivity theory of distribution becomes the marginal productivity theory of rent determination for every factor of production. In this way, Fetter generalized the narrow classical analysis of land rent into a broader theory of factor pricing. Each individual has a personal time-preference schedule, a schedule relating his choice of present and future goods to his stock of available present goods. As his stock of present goods increases, the marginal value of future goods rises, and his rate of time preference tends to fall. These individual schedules interact on the time market to set, at any given time, a social rate of time preference. This rate, in turn, constitutes the interest rate on the market, and it is this interest rate that is used to convert (or "discount") all future values into present values, whether the future good happens to be a bond (a claim to future money) or more specifically the expected future rentals from land or capital. Thus, Fetter was the first economist to explain interest rates solely by time preference. Every factor of production earns its rent in accordance with its marginal product, and every future rental return is discounted, or "capitalized," to achieve its present value in accordance with the overall social rate of time preference. This means that a firm that buys a machine will only pay the present value of expected future rental incomes, discounted by the social rate of time preference. Similarly, when a capitalist hires a worker or rents land, he will pay now, not the factor's full marginal product, but the expected future marginal product discounted by the social rate of time preference. Fetter pointed out that interest is not an income per unit time, like wages. Thus, it is not appropriate to apply the marginal productivity theory to interest determination in the typical fashion of beginning with an exposition of the theory applied to wage determination. Then, shifting to a discussion of capital, "interest" suddenly replaces "factor price" on the y-axis of the graph, and the conclusion is swiftly reached that the marginal productivity theory explains the interest rate in the same way that it explains the wage rate. Yet the correct analog on the y-axis is not the interest rate but the rental price, or income, of capital goods. While factor price has a predictable, linear trend, interest would be entirely unpredictable and non-linear. In fact, the interest rate only enters the picture when the market price of the capital goods as a whole is formed out of the expected annual future income. Interest, Fetter thus noted, is a rate, or ratio, between present and future, between future earnings and present price or payment. Fetter asked the question: What is capital? He answered that it is either the money or the thing whose value is expressed in money. Money is itself a concrete thing, one in which the value of other things is expressed. It is this expression and measurement of market value that is the essence of the capital concept in much business usage, as well as in most economic discussion, no matter what may be the formal definition. Capital is an aspect of material things, or, better, it consists of material things considered in one aspect, their market value. It is under this aspect that people have come more and more to look at wealth. The growth of a money economy has made it more and more convenient to compare and measure the value of dissimilar things in terms of dollars. Things are thus capitalized (Fetter 1900). Capital is economic wealth whose quantity is expressed in a general value unit. It is used as applying to a single thing or to a group of things. There is no place in it for the distinction, the inconsistencies of which have been discussed, between individual and social capital. The services of things that minister directly to satisfaction cannot be called unproductive, while the personal services of people are called productive, even where nothing material results. The distinction between consumption and production goods as essential in economic discussion is not retained. All valuable things of more than momentary duration are "intermediate goods," are capital, in that their value became designed to satisfy future wants. While the definition thus sweeps away any limitation on the content of capital because of a difference in future wants, it likewise sweeps away any limitation because of a difference in the origin or source of its value. Capital is not thought of as made up only of goods whose value is the result of labor. It has been shown that the prevailing distinction between "natural agents" and "produced agents" of production involves radical defects of logic and is practically not maintained. This definition is emancipated from the false labor theory of value. In regard to the contending views—first, that capital consists of concrete goods, and, second, that it is the value of goods—the definition harmonizes them by defining capital as consisting of the concrete things, but only when considered as homogeneous and comparable units of value (Fetter 1900). Fetter viewed the value of production goods as divided according to two time-based categories: rent—the value of temporary use; and capitalization—the value of permanent control or ownership. Fetter defined capital as "economic wealth expressed in terms of the general unit of value." And while capital, at any moment in time, includes all economic goods in existence, Fetter said that most capital is "composed of things durable." For this reason, "when interest is defined as the payment for the use of capital, it is connected with all wealth that is expressed in the capital form" (Rothbard 1962). It compels us to say that a thing becomes capital or ceases to be capital not because of any change in its physical or economic nature, not because it is more or less serviceable to the community, not because the use to which it is put is altered, but simply because the man who owns it does or does not happen to be the one who enjoys that “it.” Now Böhm-Bawerk himself, in his interest theory, has given us a hint of the way such an absurdity can be avoided without the “it” of a separate concept though he does not see the application possible here. The person who rents a house buys the "material services" of the thing during a definite period. The whole value of the house is simply the sum of a long series of uses. To the logical eye, though not to the technical eye of the law, the tenant or user is the owner of the thing during the time, with only such conditions as will insure its safe keeping and return at the close of the period. It may be looked upon as a sale to the tenant of a use or a group of uses defined by a period of time, and with the agreement to return the use (Fetter 1900). The distinction between private and social capital is considered by Böhm-Bawerk to be of the very greatest importance, and he deems his clear distinguishing of them to be one of his highest services to economic theory. The failure to distinguish them, he thinks, is the chief reason for the "false" productivity theory of interest. If the difference is not seen between capital, the source of interest, and capital, the tool in production, interest, he argues, is naturally thought to be due to productivity. But, if it is clearly seen that a part of interest-bearing capital is not a tool in production, then productivity cannot be the one essential explanation of interest (Fetter 1900). For Fetter, interest permeated all time-consuming action and the determination of its rate was a prerequisite of, not a result of, the calculation of capital value. To make a rational account of the market value of anything, including a durable good, "its importance must be traced back to 'gratification.'" The buyer of durable wealth pays a "definite sum in return for the right to enjoy a series of future rents." It then becomes impossible that capital value could precede income, and therefore, "the mere mention of a capital sum implies the interest problem, and assumes the interest rate" (Rothbart 1962, 121–22). Prior to the advent of a mature Ludwig von Mises, Fetter was the world's leading subjective-value theorist. While Mises would bring the theory of money within a subjective-value, general theory of economics in 1912, Fetter had by 1904 already extended the principle of subjective value to bring factor prices and the rate of interest into a unified theory. The distinctiveness of his contribution was not lost on the profession at large, and it was widely recognized as an Austrian one. Fetter had rejected the profession's "return towards the objective cost explanation" from the "purely psychic explanation of economic phenomena in terms of utility." Instead, Fetter held, that the Austrians were, after all, on the way towards a true and consistent interpretation of economic activity. Fetter saw "economics as essentially the study of value, and has viewed all economic phenomena as the concrete expression, under varied circumstances, of one uniform theory of value." Fetter himself was so adamant about the subjective nature of value in economic theory that he referred to the revolution in economic thought in the 1870s not as the Marginalist Revolution, but rather describing the new approach as "subjective" or "psychological." He even rejected Leon Walras as a member of the revolutionaries because he thought Walras, unlike the other mathematical marginalist Stanley Jevons, did not agree that the essence of the revolution was the reintroduction of subjective value into value theory. In Fetter's revisionist account, those responsible for this advance were Carl Menger, whose "unusual vigor, independence, and originality of his mind seem to have been felt and esteemed by all those who came in contact with him," Jevons, whose "versatility, originality, and vigor of thought are evident on every page," and John Bates Clark, who "is classed by his friendly American critics in the list of the six ablest Anglo-American economists [and] is apparently conceded by all foreign critics the deanship of American theorists" (Hoxie 1905). Fetter also recognized the larger significance of a subjective value theory replacing an objective one in the history of economic thought, saying that "the labor theory of value had been adopted by Adam Smith after only the most superficial discussion," which led him to "his confusion of ideas regarding labor embodied and labor commanded, labor as the source and as the measure of value, rent, and profits now forming a part and now not a part of price." Fetter concluded, that "the resulting confusion was felt by all of the next generation of economists." In particular David Ricardo because he accepted that Adam Smith's concept of embodied labor, exerted "a tremendous and evil influence in ways then all unforeseen… Labor is the source of value…; labor is the cause of value; labor produces all wealth. Naturally follows the ethical and political conclusion: if labor produces all wealth then labor should receive all wealth." This was a conclusion "the Ricardian socialists" were all too eager to embrace and that Karl Marx later used to great effect (Fetter 1923). Fetter maintained that income must be looked upon as a series or group of satisfactions, not as a series or group of material things. Though scattered authority may be found for this view, it is at variance with the views alike of Böhm-Bawerk, of Clark, and of Fisher, as well as those of the great majority of economists, and requires explanation and defense. The thesis is that the economic goods that are "produced" either by human effort or by the material services of goods must, in their last analysis, be looked upon as satisfactions. The main advantage of foreign trade is the same as that of any other exchange. It is hardly necessary to review the explanation here: the increased efficiency of labor when it is applied in the way for which each country is best fitted; the liberation of productive forces for the best uses: the development of special branches of industry with increasing returns; the larger scale production with resulting greater use of machinery and with increased chance of invention; the destruction of local monopolies... The moral and intellectual gains of foreign commerce were formerly much emphasized... Commerce is an agent of progress; it stimulates the arts and sciences; it creates bonds of common interest; it gives an understanding of foreign peoples and an appreciation of their merits; it raises a commercial and moral barrier to war; and it furthers the ideal of a world federation, the brotherhood of man (Fetter 1904, 1905). Deservedly, Fetter rose to the top of the American economics profession. His work was routinely published in the major journals. He held professorships at several prestigious colleges and universities and was invited to speak at major events held by prominent economic associations and to write commentary for the Encyclopedia of the Social Sciences on the discipline and for European scholars on American economic thought. He was an officer, and eventually president, of the American Economic Association and a member of the American Philosophical Society. In a rare tribute, he received a note commemorating his 80th birthday in the American Economic Review and a memorial, in the same publication, upon his death. At the beginning of the twentieth century, Frank A. Fetter was one of the brightest stars in the golden era of Austrian economics. Fetter, F. A. 1894. Versuch einer Bevolkerungslehre ausgehend von einer Kritik des Malthus'schen Bevolkerungsprincips (An Essay on Population Doctrine based on a Critique of the Population Principles of Malthus). Fetter, F. A. 1895. "The Exploitation of Theories of Value in the Discussion of the Standard of Deferred Payments." Annals of the American Academy of Political and Social Science 5: 882–96. Fetter, F. A. 1895. "Theories of Value in Their Application to the Question of the Standard Deferred Payments." American Economic Association Publications10: 101–3. Fetter, F. A. 1900. "Recent Discussion of the Capital Concept." Quarterly Journal of Economics. Fetter, F. A. 1904. Principles of Economics. New York: Century. Fetter, F. A. 1912. Source Book in Economics. Fetter, F. A. 1913. "Population and Prosperity." American Economic Review 3: 5–19. Fetter, F. A. 1915. Economics, Volume 1: Economic Principles. Fetter, F. A. 1922. Economics, Vol. 2: Modern Economic Problems. Fetter, F. A. 1916. Manual of References and Exercises in Economics for Use with, Vol. 1: Economic Principles. Fetter, F. A. 1917. Manual of References and Exercises in Economics for Use with, Vol. 2: Modern Economics. Fetter, F. A. 1920. "Price Economics versus Welfare Economics." American Economic Review 10: 483–86. Fetter, F. A. 1923. "Value and the Larger Economics I: Rise of the Marginal Doctrine." Journal of Political Economy 31: 594. Fetter, F. A. 1931. Masquerade of Monopoly. Fetter, F. A. 1945. "Economic Systems; Post-War Planning." American Economic Review 35: 445–46. Fetter, F. A. 1977. Capital, Interest and Rent: Essays in the Theory of Distribution. Heberner, Jeffrey. Frank A. Fetter (1863–1949): A Forgotten Giant. Ludwig von Mises Institute. Retrieved April 24, 2007. Hoxie, Robert F. 1905. "Fetter's Theory of Value." Quarterly Journal of Economics 19: 210–11. Rothbard, M. R. 1962. Man, Economy, and State. Los Angeles: Nash Publishing Corp., 115, 387–409. Biography of Frank A. Fetter – Ludwig von Mises Institute. This page was last modified on 26 April 2017, at 15:18.